Jeannette Vasquez’s resume said it all: “Energetic,conscientious, reliable production team player.” Add 12 years of award-winning work as a packaging machine operator with Ocean Spray in Bordentown, NJ, and Vasquez was the perfect fit for a production-job opening at Salvona’s new manufacturing plant in Hamilton, just six miles north of Ocean Spray’s shuttered facility. But that six miles was an ocean away. operate the company’s new manufacturing facility. 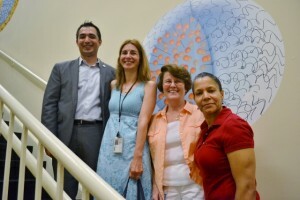 (From bottom right) Production worker Jeannette Vasquez, Salvona HR Manager Joan McCormack, NJ Department of Labor’s Iliana Ivanov, and RTWNJ’s Daniel Lim pose in front of a graphic illustration of one of Salvona’s encapsulation technologies. Fortunately, Vasquez and McCormack, the job searcher and the job hirer, found each other through the one service that was able to connect them – Ready to Work New Jersey (RTWNJ). Awarded to the NJ Community College Consortium for Workforce & Economic Development, this federal grant program provides job training, job placement assistance and support services to long-term-unemployed state residents. Priority preference is given to US military veterans. The program also provides on-the-job training salary reimbursements of up to $10,000 to participating employers. Vasquez, a US Army veteran, learned about the program through a local veterans’ affairs office. Upon registering for RTWNJ, she was invited to attend a 2-day career workshop held at Camden County College where she met college Director Melanie Monturano and RTWNJ Coordinator Daniel Lim. Lim & Monturano were immediately impressed with Vasquez and her resume. “Within the first five minutes we knew Jeannette was a star!” Monturano recalls. Later that day, Lim and Monturano sent Vasquez’s resume to McCormack at Salvona. At 7:00 a.m. the next morning, McCormack received a call from Vasquez. Equally impressed, McCormack invited Vasquez to meet with the company’s production manager that very same day. He offered Vasqueza job on the spot. Vasquez immediately accepted. McCormack, who has been with the company for nine years, could not be more pleased with her new hire. “The biggest thing is she’s so positive, she wants to move up,” says McCormack. There’s little doubt she will. The company, which has grown from 9 to 38 employees since 1998, opened its Hamilton facility in June 2014. Salvona maintains 80 patents, including its “encapsulation” technology, which extends the shelf life of skin care products and controls the release and absorption of key ingredients for optimal benefit. Salvona has now hired three production employees through Ready to Work NJ, and McCormack says she plans to use the program to hire more employees as the company expands its manufacturing operations. This story was originally published in the October 2015 issue of New Jersey Business, the magazine of the New Jersey Business & Industry Association. The author is Christopher Biddle, President of Biddle Communications & Public Relations.